You are a mother of an autistic son. How did you feel when you son was diagnosed with autism? I felt a palpable kick to the chest. I was seven months pregnant with my daughter and I started crying so hard and loud, my husband and the psychologist were afraid I was going to bring on labor. It was floating around in my head as a possibility, but not ever a true possibility that my beloved baby could have a brain disorder. What advice do you have for mothers who have children with autism? It is the most brutal ride you can go on. The diagnostician for my son said it was worse than having a fatal illness, because once the child dies, you lose a piece of your heart forever, but you do move on. With an autistic child you have to worry about not only what their childhood and adolescence will be like, and how to get the proper treatment/education, but what their adult life will be like. Who will take care of them once you are gone? It is an anxiety that is so deep you cannot approach it alone or just with your partner. My advice is to get the child into treatment as soon as you suspect something is off. My doubts began when my son was 12 months old. He wasn't gaining any new words. The worst thing is to listen to anybody who is trying to soothe you that nothing is wrong, or that it is just a simple speech delay and they will catch up. People lie to you because they don't want to hurt your feelings; they don't want to have awkwardness in the moment if you seem worried. They want to make you feel better in the moment. These are the most dangerous people to your child's future. I listened to them because that was what I wanted to hear. It is the biggest regret of my life. The research into autism has come a long way? What are some of the recent findings you have heard about? Pathways of information transfer from brain regions is different in people with Autism Spectrum Disorder. This has been found in babies are young as six months. By two years it shows usually in communication, but it also means that the superhighways of the brain are starting to become entrenched. A child usually starts demonstrating self-stimulation, or 'stimming,' engaging in hand flapping or lining things up or other repetitive behaviors. The brain is starving for new information to get in. Walls are being built up preventing information to get in through sensory information and language. Neural pruning begins. This is why behavioral intervention is essential as early as possible. I would advise all parents to have a check by a specialist by 18 months. Is there a way to treat or manage autism successfully? Behavioral Intervention, also known as ABA, Applied Behavioral Analysis, Discrete Trial Instruction. Research the Early Start Denver Model, or ESDM. At home or anywhere, engage in reciprocal play, Try to get a response in a game that involves the child understanding and responding. This will help keep the walls from building up. The idea is to reach into your child’s mind and keep him/her from getting lost in autism. Make things fun with songs and dance. Music is very powerful. Can you tell us a bit more about your book “If You Suspect Autism in Your Child”? The tile of this book follows the question, If you suspect autism in your child - ACT!. Get diagnosed, get legal help for the child’s rights, get to an expert diagnostic center, even if you have to fly there, it’s worth it. It is stories by parents of kids with autism, by people who have autism or siblings. It has a directory of international diagnostic centers. Start a collection of books including Disability Law. What do you wish you knew about Autism then that you know now? I wish I knew to follow my earliest instincts, rather than listening to people trying to make me feel better by saying I was overreacting. that it was probably nothing to worry about. I wish I knew that taking the word of a local pediatrician was not good enough - they are not experts. I wish I knew earlier that my child had legal rights. Is there somewhere we can find out more about you and your work? 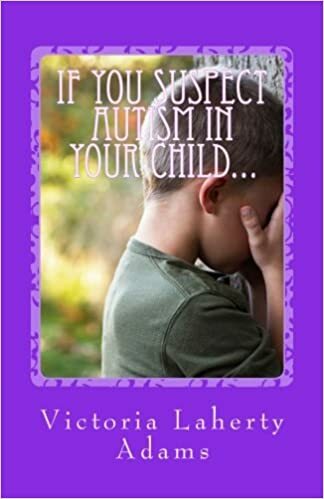 I tell a long story about myself and my journey with my son in ‘If You Suspect Autism in your Child…’ I am writing a book now which has a creatively constructed version of myself called, Sudden Money. It will be available on Amazon Early 2019. This is a nice post to have and discuss. Hostgator Coupons India is giving you best offer.